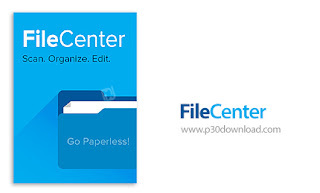 FileCenter is a powerful program for scanning, archiving, organizing and finding computer files. This software easily manages and organizes your files and links PDF files from one another to another. Also, this software can open and view PDF files and add, delete and separate pages. PDF search, direct scan for word processor, file finder, pdf composition, pdf separation, page transitions between pdf files, ability to convert any file to pdf, auto-isolation and save Scans, organizing files inside the original file and ... the features of this software. - Operating System: Windows 7, Windows 8, Windows 8.1, Windows 10, Windows Server 2003 (or newer). Full compatibility with 64-bit machines. 1- Install the software. Install it as a Trial when installing. 3. When the software is activated, select the Professional Plus option and register it using one of the serial numbers in the data in the Serial.txt file.